Award winner Mr Tim Lyons of Western Australia-based company One Atmosphere. The 2014 DSTO Eureka Prize in support of Outstanding Science for Safeguarding Australia has been won by the One Atmosphere company for developing the Pegasus emergency system designed to rescue helicopters ditched in the sea. Assistant Minister for Defence, Stuart Robert, last night presented a trophy and cash prize of $10,000 to the Perth-based company's founder and managing director Tim Lyons at the Eureka Prize awards ceremony in Sydney. Attached to the helicopter, the Pegasus is a light-weight, bolt-on, bolt-off buoyancy system (like an air bag) that inflates automatically on impact and is capable of quickly retrieving an aircraft up to 10 tonnes in weight from a depth of 10 metres and keeping it afloat for four hours. This system allows helicopter crew to escape safely in case of accidents in water. Pegasus has been designed for the Army's Tiger Armed Reconnaissance Helicopter but is flexible enough to be fitted to any helicopter that is required to operate over water. The technology can also be transferred to the civilian arena for helicopters operated by emergency services, police, tourism and the oil and gas exploration companies. The Pegasus system was developed with funding from the Capability and Technology Demonstrator (CTD) Program managed by DSTO. With the successful demonstration of the technology, the Pegasus system is now being considered for further development and eventual integration into the Army helicopter fleet after airworthiness certification. Tim Lyons was previously Submarine Escape and Rescue Manager for the Royal Australian Navy (RAN) and has since developed various buoyancy systems applicable to the defence, mining and commercial sectors. See the media release at the Department of Defence website. Imagery is available through the Defence Image Library. 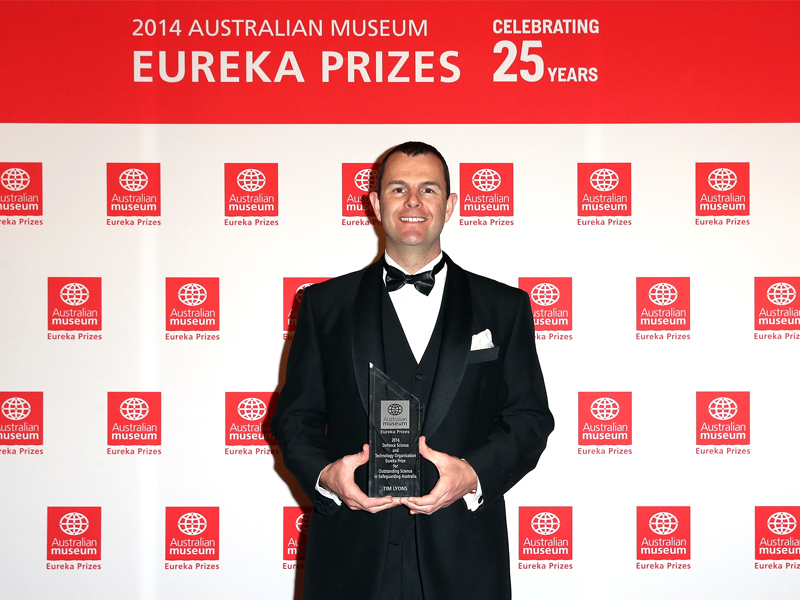 2014 Australian Museum Eureka Prizes photography by Mark Metcalfe.